The Lord God, the Creator, made each part of His universe to reveal His wisdom, glory, and nature. “For since the creation of the world His invisible attributes are clearly seen, being understood by the things that are made, even His eternal power and Godhead…” (Rom.1:20). All His creation reveals His glory; and it also instructs us, His new creation. In this article we want to focus on the eagle. But first let us consider the spiritual significance of some other birds. About the sparrow our Lord said, “Are not two sparrows sold for a penny? And not one of them falls to the ground without your Father knowing it” (Mt.10:29). So the sparrow speaks of those Christians who feel of little worth, yet the eye of the Lord is upon them for good, and He cares for them. The raven, an unclean bird, was used by God to feed the mighty prophet Elijah. This speaks of the unclean or unsaved people that the Lord will use to provide for His servants. The owl is a type of human wisdom, which appears to be wise but is not the true wisdom of God. The owl is a bird of the night, signifying that those who trust in the wisdom of this world are of the darkness. The dove is a symbol of the Holy Spirit, and also of peace. The dove has no gall bladder, which is a symbol of bitterness. The dove is also a symbol of faithfulness, having only one mate for life. Let us now consider the mighty eagle. It portrays the Lord Jesus, the one who soars into the heavenlies as the Son of God. The eagle can also portray the mature Christians, the sons of God. The eagle is a bird of prey, just as we are called to destroy the enemy. The eagle is especially able to fight and overcome snakes, which are a symbol of Satan and his demons. 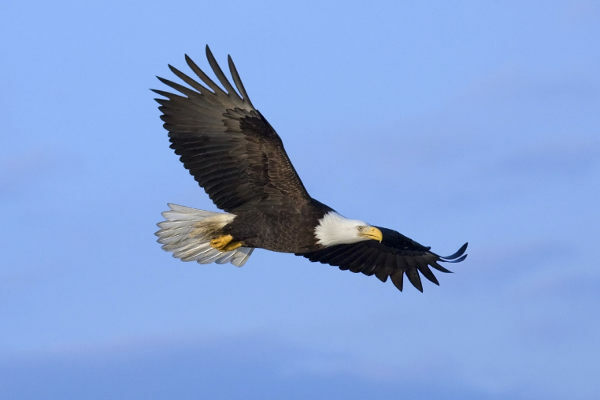 The eagle also has a telescopic eye and sees things afar off. Similarly, the eagle Christians are men and women of vision, who see the goal of the high call of God. Eagles are swift, just as the King’s business demands haste. We cannot waste time while doing the Lord’s work. Also, eagles dwell and make their nests in the high rocks. Eagles symbolize the overcomer, as the following experience will illustrate. Once, while pastoring, I was experiencing persecution. One night I had a vision of a long valley. At the far end a storm was gathering. As it came rushing down the valley with increasing intensity, the other birds hid for fear until the storm would pass. However, at the other end of the valley there was a great eagle. As it smelled the coming storm, instead of hiding like the smaller birds, it stretched out its tremendous wings. The storm that sent the lesser birds seeking refuge was actually the very means by which the eagle rose to higher heights. It sprang into the storm with a joy that I felt pulsating in my own heart. I began to understand how that eagle Christian of old, the Apostle Paul, could triumphantly declare that he gloried in tribulations (Romans 5:3). Beloved, this is the attitude of eagle Christians. Eagles are symbols that were used by victorious kings and conquerors. They are also symbols of God’s kings and priests who shall triumph gloriously over the storms of life and soar to higher heights in Him. “But those who wait on the Lord shall renew their strength; they shall mount up with wings like eagles; they shall run and not be weary…” (Isaiah 40:31). We will learn to soar as He does into heavenly places, and yet also see the enemy afar off, to swiftly descend and defend the weaker ones. May God bless all you eagle and young eaglet Christians with glorious days of victory ahead. Stretch forth your wings and face the storms of life, using adversity to climb to higher heights! In so doing, you will be more than a conqueror through our beloved Jesus, the Glorious Eagle King.